1. This modem uses Bell 103A modulation, in "Originate Mode" only. Unfortunately, that means you probably couldn't have two Livermore Data Systems Model A modems talk to each other. The "Model C" seems to be the first one that also supported "Answer Mode" modulation. 3. The host used in the video, as well as all the accounts, credentials, &etc, were set up in my lab specifically for testing the modem and were taken down the next day. Hence, I didn't have to worry about obscuring my typing or login credentials, &etc. Thank you to all the concerned people out there who warned me that someone might be able to deduce what I was typing. 4. We didn't do PPP or SLIP across dial-up modems prior to 9600 baud because the protocol overhead would saturate the line. In my mind, it doesn't matter at which point in the communications path each layer of the OSI model gets peeled back, the data from the host still made it to the client. Dialing in to terminal servers (or directly into UNIX boxes or mainframes) is how "we did it back then." I did subsequently get a very relaxed-protocol PPP connection to work through the modem, but it barely functioned. 56-byte pings took between 3000 and 5000 ms. DNS saturated the lines. TCP connections failed (handshake timeout) most of the time due to the latency. A browser simply wouldn't load a page. Any chance of some internal shots? Some vintage hardware pron? I was linked to the video of the modem on facebook several days ago, and I've shown it to several people since. I can't wait to show it to my dad--he did the BBS thing when I was growing up, even running one at one point. I'm not much of a computer geek (I used the internet but don't really care how it works), but I think this is so cool and amazing! You should get some really good photos, maybe someone could fix up a schematic from them. That would be cool and possibly interesting (given the apparent resilience of the design -- it still works after 46 years). Absolutely superb. A beautiful piece of historic hardware to own. Thanks for sharing. I'd never even realised RS-232 was that old. Amazing how it has stood the test of time. Great vid and amazing bit of history, but theres just one thing that I don't get - this modem is pretty much designed to be portable; but in 1964/5, surely everything else (VDU, CPU etc...) definately wouldn't be? So who was this aimed at, and what would they do with it? I HAVE A MODEL A, what are they worth?????? 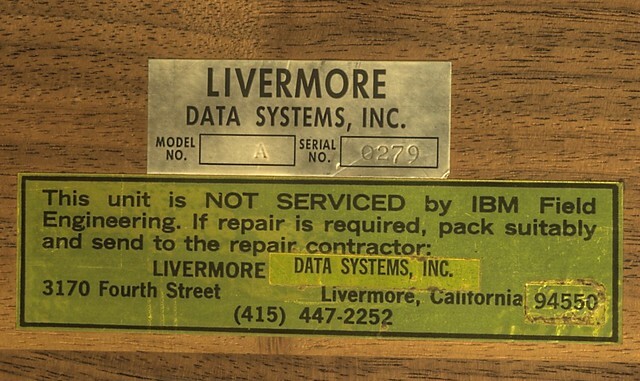 My dad was one of the founders of Livermore Data Systems. As a kid I worked on those animals, as well as Model 71s and Star 80s before going off to college. Thanks for posting.